Today’s First Line Friday is one where I met the author AND artist of the cover design last year! Following a suicide attempt and consigned to a segregated insane asylum, attorney James P. D. Gardner finds himself under the care of Dr. James Boozer. Fresh out of medical school, Dr. Boozer is eager to try the new talking cure for insanity, and encourages his elderly patient to reminisce about his experiences as the first black attorney to practice law in nineteenth-century West Virginia. Gardner’s most memorable case was the one in which he helped to defend a white man on trial for the murder of his young bride—a case that the prosecution based on the testimony of a ghost. Beautiful, willful Zona Heaster has always lived in the mountains of West Virginia. Despite her mother’s misgivings, Zona marries Erasmus Trout Shue, the handsome blacksmith who has recently come to Greenbrier County. After weeks of silence from the newlyweds, riders come to the Heasters’ place to tell them that Zona has died from a fall, attributed to a recent illness. Mary Jane is determined to get justice for her daughter. A month after the funeral, she informs the county prosecutor that Zona’s ghost appeared to her, saying that she had been murdered. An autopsy, ordered by the reluctant prosecutor, confirms her claim. With its unique blend of masterful research and mesmerizing folklore, illuminating the story’s fascinating and complex characters, The Unquiet Grave confirms Sharyn McCrumb’s place among the finest Southern writers at work today. 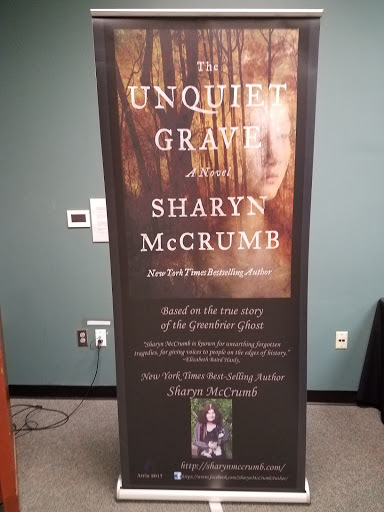 This past Saturday, November 4th I had the opportunity to go to a “meet and greet” and book signing for author Sharyn McCrumb and her newest novel The Unquiet Grave. This was made possible through the Cobb County Public Library and was located at the Switzer library in Marietta. I learned they host these events from time to time and hope to attend more. I always love meeting authors, especially when they are ‘new to me’ authors! This is the program and the book. I arrived at the event a little over 30 minutes before starting time. That was a good thing as it ended up being a full house! And I got a front row seat!!! Sharyn has written many novels. Here are some displayed. This is author Sharyn McCrumb and we were also in for a treat: The gentleman pictured is artist Thomas Dodd whose artwork was used for the cover of The Unquiet Grave. Sharyn shared how she had to fight to get that picture as the publishers wanted palm trees on the cover. But the novel takes place in West Virginia and “Hello! There are no palm trees in West Virginia!” Then another idea mentioned was where the perspective was going to be from a grave, but according to Sharyn, it looked like a cucumber! lol. She found Thomas’ picture and it was exactly what she was looking for and the publishers eventually gave her what she wanted. Sharyn discussed her newest novel. It was a folk tale and as folk tales are so short most information is incorrect. She talked about her meticulous research involved in writing the novel. And in fact, she is still researching it and the book has been out for seven weeks! There is so much more she wants to learn. She shared that she pictured one person, James P.D. Gardner as a Morgan Freeman type, but then she found a picture of him and OOPS! He actually was a Chris Rock type. She had to rewrite everything with him! That is a big difference: picturing Morgan Freeman and in actuality you get Chris Rock! When she was done talking she answered some questions and she tells it like it is with her answers. Signing books and talking to readers! I got to talk with her and get a few pictures! I also made two new friends! We had a great talk once the event was over. One lady has met thousands of authors. I hope to see these ladies again at future events. Some people attend these events over and over. I might become one of them!